The Vikings have just eight games under Mike Zimmer where they haven’t recorded a sack, but two have come in the last five weeks. Since Mike Zimmer became the Vikings’ head coach in 2014, their defense has allowed opponents to gain more than 400 yards just nine times. That’s tied with the Broncos for the fewest in football during that time, and no other team has done better than 12. So when it happens to the Vikings — as it did again on Sunday — it’s significant. And after the Patriots’ performance against the Vikings on Sunday, two of the three most productive days against a Zimmer defense have come in the 2018 season. The Patriots put up 471 yards on Sunday, with an approach that was markedly different than the Rams used to gain 556 in Week 4. If that night was about innovative play design from Sean McVay and quarterbacking excellence from Jared Goff, New England’s performance on Sunday was more about simplicity from offensive coordinator Josh McDaniels and efficiency from Tom Brady, who threw for 311 yards despite his average pass traveling just 4.4 yards in the air, according to Pro Football Focus. The Patriots ran the ball 39 times and threw it 32 times, establishing their run game as coach Mike Zimmer predicted they’d y to do, and providing something of a foil for a Vikings offense that Zimmer said again needs to run the ball more often. 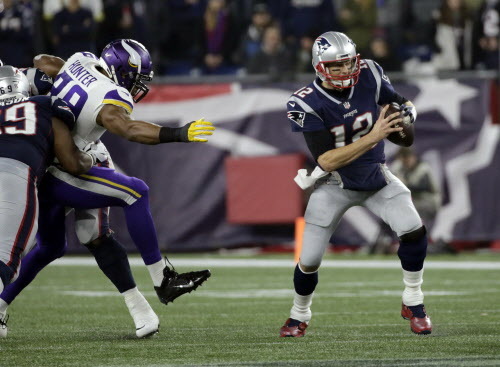 But when he did throw, instead of picking on a depleted Vikings secondary, Brady took an approach that revealed his main objective: keeping the Vikings’ pass rush at bay. It worked for the three-time MVP, who wasn’t sacked and was only hit once on Sunday. That hit, which came off a blitz from Harrison Smith, led to Brady’s one turnover of the day when he was intercepted by Eric Kendricks in the fourth quarter. But for much of the day, Brady wasn’t pressured by a Vikings defense that had to rely on its front four with so many injuries in the secondary. He connected on quick throws to Julian Edelman, Chris Hogan, Cordarrelle Patterson and Rex Burkhead to start the game, as the Patriots opened with passes on five offensive plays before Edelman gained 15 on a jet sweep and the Patriots punched the ball into the end zone on runs from Sony Michel and James Develin. On the throw to Patterson, the wide receiver blocked former teammate Everson Griffen before releasing to the flat, gaining 24 yards after Mackensie Alexander got sucked inside (Alexander was pulled from the game on the next play in favor of Marcus Sherels). Running back James White, who was targeted nine times, finished as the Patriots’ leading receiver with seven catches for 92 yards off a heavy diet of screens. The Vikings have just eight games under Zimmer where they haven’t recorded a sack, but two have come in the last five weeks, against Drew Brees and Brady. Those two quarterbacks, of course, are two of the game’s best at getting rid of the ball quickly, but when the Vikings aren’t able to get home with four pass rushers, they’re apt to find themselves in trouble, given the fact they’re typically not a team that uses a particularly high volume of blitzes. On Sunday, when they were unable to get to Brady, they left themselves open for a long day trying to tackle his receivers in the middle of the field.